UnKoch My Campus works with passionate students, fiery faculty, and concerned community members to fight the corrupting influence of Koch brothers’ funding at over 300 universities across the country. Through research, media outreach, and campus organizing, we expose the ways private donors are buying control of our universities and we develop lasting solutions to protect academic freedom and integrity. To see the power Koch is buying over our schools, review our report on Florida State University (where Koch was given contractual power over hiring and programming and gained control over introductory courses). 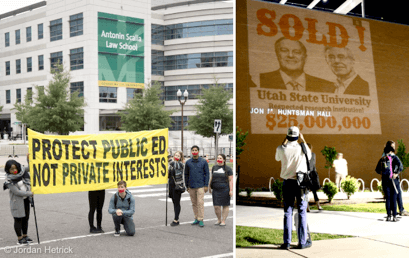 To see what UnKoch is doing about it, check out the growing faculty resistance around the country and read about the students at George Mason University who just sued their school for transparency of private donor agreements! We know that our universities are being leveraged by special interests to attack our democracy. With your help, we can make sure the resistance to those very attacks are coming from within our universities, too. Help our small staff team keep this work alive by making a tax-deductible donation or contact Samantha Parsons at [email protected] to get involved. Students protest outside of George Mason University’s Antonin Scalia Law School after a $30 million donation from the Charles Koch Foundation and an anonymous donor (left). Students project images on the wall of the Jon M. Huntsmann School of Business at Utah State University, Koch’s top funded business school in the country (right).